Q. What are the names of the sculptures around campus? There are a number of sculptures and installation pieces around the campus? What are they called? Is there some more information about them available? update: As a note, some of this information has changed since this post. Rather than alter the text below, felt it was better to add this link: Spaces Sculpture Trail (from al.com, January 2015). It replaces, at least slightly, the "Weave Your way" link, below with more up-to-date descriptions. There are a number of sculptures, installation pieces, 3D constructions, and other varieties of the plastic arts around campus. Intersted in knowing more about them? There are a couple of websites that can help. The first is a long al.com article: Weave your way through Huntsville to find 25 pieces of new sculpture trail. As the title suggests, this has more than just the campus in mind, but on down the page there is a section for UAH. Each piece has a write up and artist information. See the example, below, from Glenn Zweygardt's "Early Homeland Security". 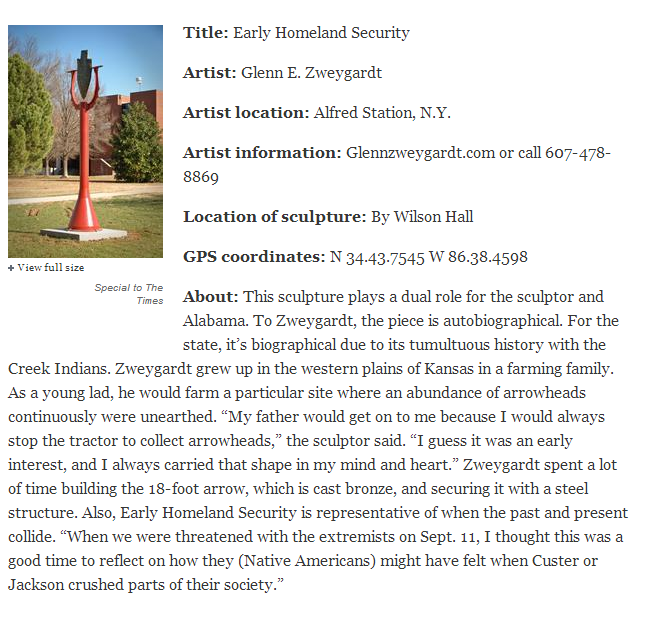 Another resource you can use is from Spaces Sculpture Trail website (Note, link no longer works as of 2015-08-30) for those specific to campus, which also includes background information. It includes a phone number you can call to get an information virtual-tour message.